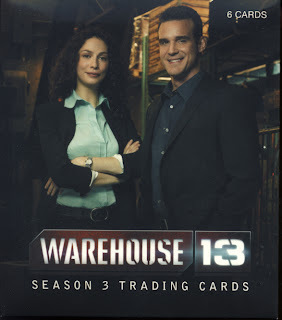 Rittenhouse Archives brings back Warehouse 13 for Season 3 in Premium Pack with more artifacts secretly stashed in South Dakota and other goodies. Once again Rittenhouse Archives has completely captured the feel of the show and put it in card form. The biggest change from last season’s cards is one less autograph and one more relic, a seemingly natural transition as the show and cards continue on, the original configuration was 2 autos and 2 relics. The other change is the absence of serial numbering on the episode cards. 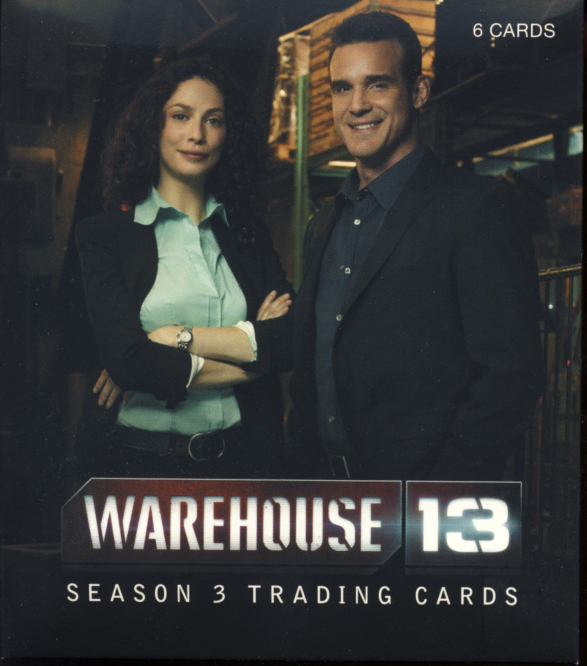 2011 Rittenhouse Archives Warehouse 13 Season 3 falls under our premium cards category. Each Premium Pack contains 2 Episode Cards, 2 Relic Cards, 1 Artifact Card and 1 Autograph Card. These can be purchased by individual packs or a 15 pack box. Strata is plural for stratum. Stratum is defined as any of several parallel layers or levels of something. The most predominant example is in geology where sedimentary rock and soil form layers that vary in color . 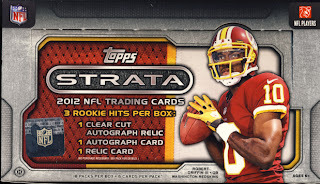 So with a product that includes hits that are constructed with layers of cardboard, acetate, memorabilia and autographs of some of the NFL’s newest emerging stars, layered one on top of the other, it seem apropos that it has been given the name 2012 Topps Strata Football. 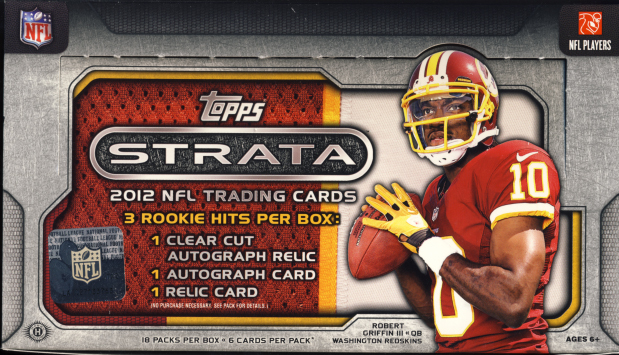 2012 Topps Strata Football is certainly on the higher end of the category from a cost standpoint, but still falls under our classification of trading cards. 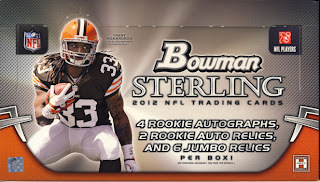 Hobby boxes include 18 packs with 5 cards per pack with the promise of 3 Rookie hits per box, 1 Clear Cut Autograph relic, 1 autograph card and 1 relic card. For collectors that appreciate die-cut cards, some of the best you will find are in the Crown Royale line of cards. 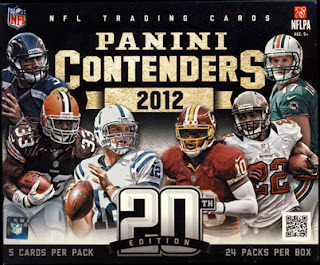 2012 Panini Crown Royale Football is a visual feast that continues to make this a great set. 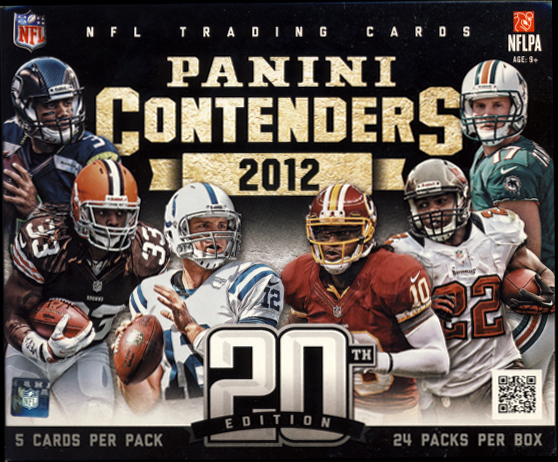 The consistency of theme and respect for the history of the brand makes these cards a pleasure to collect. While there is one less card per pack compared to last year’s configuration, it is still one of the nicest looking premium offerings available. There is also a surprise that was unannounced at release time. There are very rare color parallels of the base cards that were not die-cut and we happen to pull one of those. There is more information on this below, next to the image of the card. 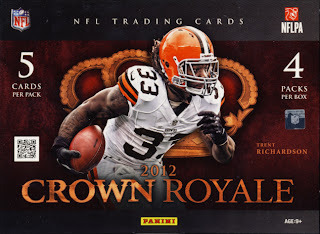 Panini Crown Royale Football falls into our premium cards category. 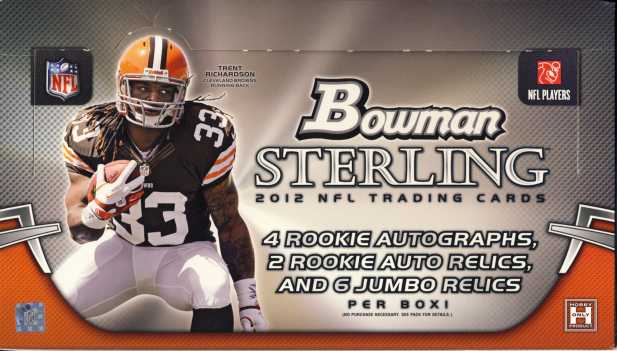 Each box contains 4 packs with 5 cards each with a promise of four autograph or memorabilia cards that include at least 1 Rookie Silhouette Signature, 1 Rookie Signature and 2 other auto/memorabilia cards. Limited Football returns this year delivering its familiar configuration. With a shift towards slightly more shiny over last year’s offering, 2012 Panini Limited Football is a nice and easy box break. Other than that not much has changed from last year with the exception of one less card in the box, but that is barely noticeable when you are searching for hits and they have remained the same number. 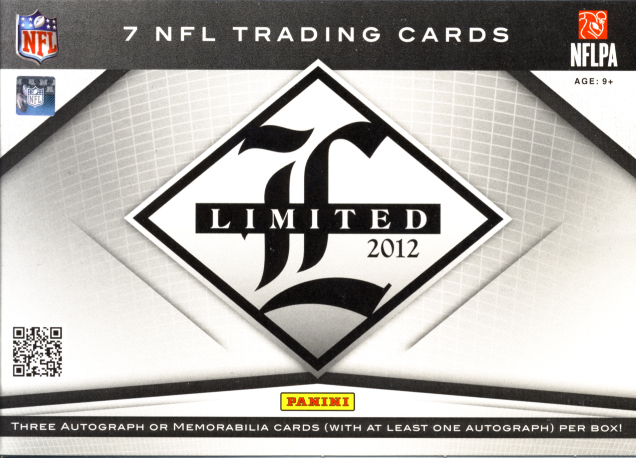 Limited Football fits nicely into our premium cards category. Each hobby box contains 7 cards with a promise of three autograph or memorabilia cards with at least one autograph per box.